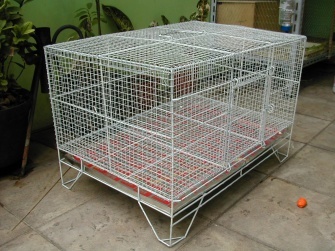 There are many kinds of indoor rabbit cages that you can choose and buy in pet shops. Most common options available are wire floor type with tray, or solid floor made of wood or hard plastic. What kind of indoor cage do you have for your rabbit? You can share and let us know! Share YOUR rabbit cage model here! Wire floor makes rabbit’s pee and pills fall down easily to the tray under the cage. You just need to pull out the tray to clean it, once or twice a day will be sufficient to keep clean the cage. Hey… don’t throw away the rabbit pills to the litter bin! Do you know rabbit pills are good for plant fertilizer? I use to put them into the flower pots in my porch. 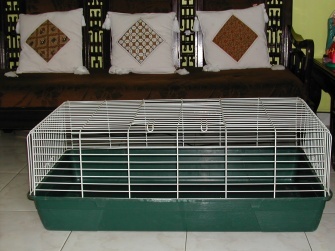 An indoor rabbit cage made of all plastic-wrapped wires, with tray under the cage. Remember to put solid mat in some area in the cage allowing resting for rabbit legs because wire floor can be tiring for your rabbit. If you like the idea wire floor plus tray because easy cleaning, you may also look for the floor made of wood or bamboo strips. The pee and pills still can be flowing through the gap between the strips and they are good mat for rabbits. If you have litter trained rabbit, a cage with solid floor is best choice. Just put litter box inside the cage and clean it regularly. You can put hays or wood shavings or other materials you can buy in pet shops into the litter box to keep it dry and cleaner. The hays need to be replaced every one or two days, wood shavings may be replaced longer. An indoor cage with solid floor made of hard plastic in my living room. You should place indoor cages inside your house in area that have good ventilation. With good airflow your rabbits will get fresh air and the air circulation is good to keep away the room from rabbit urine odor. If you use indoor cage just for rabbit home, means the door always open and your house rabbit can run in and out the cage freely, you should consider to put the litter box inside and outside the cage. But put the food and water only inside the cage. It will teach the rabbit to know that the cage is his home.